Finding time to get enough exercise is difficult for everyone, especially if you have children. If you are looking for a new way to have a great time with your kids and get in shape, you should consider starting a running plan for your entire family. With just a few easy steps, you will all be getting exercise and enjoying wonderful family time. Before you start running together, you need to make sure everyone has the proper gear. If you plan on running regularly, each of you need to have a good pair of shoes. You don’t need to go broke buying new, expensive shoes for everyone, just make sure that each pair fits and has good support. Most tennis shoes will be fine for the children, until they decide whether they want to run seriously. Make sure each person has reflective clothing to wear as you run together. If you have small children who may become too excited and run away from the group, you may want to consider using a halter type device to keep them from running into the street. If you have very small children, you don’t need to leave them out of the fun. Many companies sell running strollers that are lightweight and easy to push as you run. If you want to run to have fun and not to prepare for a marathon, then playing games with your children is the best way to start. Play tag or have races in the backyard. Make up silly games and run all over the yard. This is the best way to get young children interested in running. When young children want to “train” with you, it is best to start slow. For children who are around 7 years old, you can start to run with them. Try a quarter of a mile. If you are both having fun and not too tired, add a minute or two to your run. Once you have worked up to jogging three and a half miles, you can think about running a 5K together. Remember that when you start training, you and your child should jog for 10-15 seconds then walk for 40 seconds. Adjust the jogging/walking times as your endurance builds up. If your child is older, you can begin with a longer distance, but still make sure that you are jogging more than walking to start. Again, as your endurance builds, add more jogging time in between walking bouts. A 10K is entirely possible with children as young as 10 years old, especially the popular color runs. Children love having different colors tossed at them as they run. Working toward running a color marathon is a great way to motivate your children to get off the couch and put on a pair of running shoes. Running is a wonderful way for families to spend quality time together and lose their couch potato habits. TV and other electronics entice kids to sit instead of exercise, but being able to run with you is exciting enough to get them moving. Running is a great way to get that body you dream of and to reduce stress at the same time. Unfortunately, many people seem to believe that they can just put a pair of running shoes on and take off. When they discover it isn’t that easy, they may give up quickly. To build yourself into a distance runner, follow these easy tips. Make sure you have theright shoes. Not every pair of tennis shoes is good for running. They may be called athletic shoes, but shoes designed for running are usually lighter weight and have more support than other shoes. Your feet, legs and back will thank you for purchasing the right shoes for your run. Don’t worry about your pace. When you start running, you need to remember that endurance needs to be built. Start with a jogging/walking routine that allows you to jog a few minutes then catch your breath as you walk. It may seem counter-productive to walk in your routine, but it is better to slow down and give yourself time to build up your speed. Make running a habit. Even if you only have a few minutes, get out every day and run. You may think short runs are a waste of time, but this is all about building the habit of wanting to run every day. Keep a log. Write down everything about your runs such as the weather, how far you went, how long it took and any problems you had. This may seem like a waste of time, but when you are having a day that makes you want to quit, you can read your log and see just how far you have come in your training. A log will help keep you motivated! Gradually add distance. You simply cannot expect to put on your shoes for the first time and run ten miles. If you believe this, your first run may also be your last because you won’t get the run you expect. Start slow and with short distances. Set achievable goals. Maybe the first two weeks, your goal is simply to run a little each day. Get yourself used to the routine and walk as much as you run. The next few weeks, you could plan to run a short distance every day. Remember the point is to set small achievable goals. Every achievement will encourage you to keep going. Don’t compare yourself to anyone. Every runner has their own strengths – use your own strengths to development the perfect routine for you. Check outcross training programs. Running will definitely change the look of your body, but there are several benefits to using a strength-training program, too. Your first running program should be a slow and easy one. You may not even feel like you are really exercising the first few weeks, but starting slow and easy will prevent injuries and keep you focused on building strength and endurance. Let your body learn the routine and work slowly and steadily toward your goals. For some people, running is not only about great exercise and getting into shape, but about building the endurance needed to run a marathon. Once you have your endurance and have signed up for that first race, there are still a few things you need to do to help you cross the finish line. In the weeks before your first marathon, you are likely to start thinking about a lot of “what ifs” that may happen. Let your family know that you are about to run your first marathon and are focusing on that. This will keep them from feeling left out if you seem quiet and reflective. While it would be great to think that your first marathon will result in a win that may not be realistic. If you believe you will win and don’t, you may lose confidence and feel like giving up running altogether. Remember that even if you are the strongest runner, there are many variables that will affect how you finish. The weather could be terrible, you may get cramps, and the route could be one that truly tests you. Don’t put all of your expectations on winning. Instead, plan on finishing the race – upright and not ill. Your first race should just be about finishing and not about beating a clock. As your race day approaches, reduce your distance training. This may not make sense, but you want to run your race on fresh legs. After not going your full distances, you will be ready to take off that morning. The best advice to remember is to keep it simple. You know what your body needs – the same things you’ve done for the last several months as you trained. Your anxiety about the race may cause you to start over-thinking everything. Don’t buy new shoes, don’t eat something new that’s supposed to give you more strength, don’t sleep more than usual. All you need to do is keep doing exactly what you have been doing. Keep everything simple. Your nerves will be humming and even though you may believe you won’t forget anything, a list will make sure you don’t. Lay out your clothes the night before and check your list. You don’t want to get to the starting line and realize you forgot your running shoes. Believe us this has happened more times than you can imagine. Check your list! Even though you don’t need to remember the course, it will ease your nerves to have an idea of where you will be running. You will know where the aid stations are and where each turn is. You will be following hundreds of other runners, so you don’t need to know the exact course before, but just knowing a little about the course can ease your nerves on the big morning. You may think that relaxing at home until the last possible minute would be the best way to start your day, but the reality is much different. What if you hit traffic on the way or there’s no parking and you have to search for a spot? You will be stressed out before the race even starts. Do yourself a favor and get there early. Follow these easy tips and enjoy your first marathon! Just a few decades ago, most people thought of marathons as grueling races run by elite athletes in the Olympics every four years. Starting with the running boom in the 1970s, however, completing a marathon became the ultimate goal for many amateur runners. Today, hundreds of thousands of people complete the 26.2 miles of marathon races held in the United States each year. Some races, such as the New York City Marathon, have grown so popular that limitations on the number of entrants have had to be imposed by race officials. Amateur runners like Gerald Kochan, whose love for long-distance running has been tempered by the realities of aging and the demands of careers and family, frequently look for alternatives to the rigors of the marathon. Race organizers found a way to accommodate these athletes: The half marathon race. Half marathons have rapidly grown in popularity. The 13.1 miles of a half marathon give the average runner with limited training time the chance to still compete in long-distance races. The half marathon also offers amateur runners a break from the physical wear and tear the body goes through during the 26.2 miles of a full marathon. New half marathons are being announced each week. A popular race in Texas that has only been around for three years is the Rockwall Patriot Half Marathon. The event is held in Rockwall, Texas, and offers runners a one-mile fun run and a 5-kilometer race in addition to the featured half marathon. Rockwall has quickly established itself as a popular event, so much so that organizers limit it to just 1,000 participants. For decorated combat veteran Gerald Kochan, the Memorial Day run in Rockwall was a milestone of sorts. 2014 marks 40 years of participating in marathons across the globe. His service in the military offered him the opportunity to travel and run marathons in Germany, England, Austria and Jordan. The half marathon in Rockwall has become one of Kochan’s favorite events because of its affiliation with “Carry the Load” and its mission of restoring Memorial Day its status as the day on which Americans remember and honor the sacrifices made by members of the military, law enforcement, firefighters and rescue personnel. 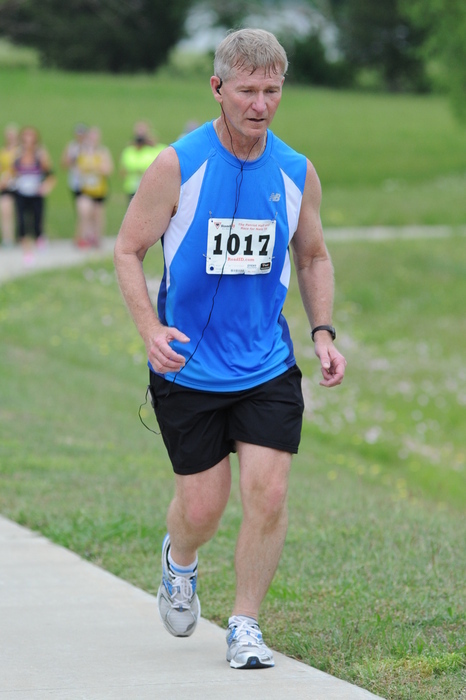 After 40 years of long-distance running, Kochan has been forced to admit that the challenge of turning in a personal best course time has given way to the satisfaction of just finishing. Along the racecourse, Kochan remembers those with whom he served his country at times of war who cannot be running at his side. If you live in a city and want to go running, all you have to do is go out your door and follow the sidewalk around the block a time or two, right? If only that were true. Fortunately, some U.S. cities have invested heavily in the sport of running as a way to keep their citizens happy and healthy. One of the perennial favorites, the Windy City has an impressive 18-mile running path that winds its way along the shore of Lake Michigan. The cooling breezes off the Lake are a blessing in the summer while the spectacular park scenery and the amazing Chicago skyline keep you going, regardless of the season. There are water fountains dotting the path to help keep you hydrated while you run. No list would be complete without the Big Apple. This concrete jungle is runner friendly, from the 60,000 members of the New York Road Runners club to the spectacular six-mile track around Central Park. You’ll always find plenty of other runners training on this track year-round. The city boasts the largest marathon in the country with a route that spans all five boroughs. Trek across the country to Oregon to find the running trails winding along the Willamette River. The multiple trails here all have one thing in common: tree-lined running paths with incredible views of the city and surrounding terrain. If you need some gear before you start your run, you’re in luck. Nike and Adidas headquarters are found in Portland. There’s running, and then there’s running in the altitude of Boulder. It doesn’t take many jogs over the different local terrains, from flatland to Rocky Mountain trails, to get you into shape for any upcoming races you were thinking of tackling. If you train at altitude, your lungs will think they’re on vacation when you run at sea level. You can’t talk about cities and running without mentioning Washington, D.C., home of the Marine Corp Marathon. With a five-mile trail that takes you past the Capitol, the Reflecting Pool and the Lincoln Memorial, it simply doesn’t get much better than this. In the springtime, be sure to hit the Rock Creek Park trails. The cherry blossoms in bloom is a can’t-miss event! Any city that offers up over 50 miles of trails for runners is serious about attracting the runner crowd. Training this far north can be a challenge in itself so to run here you have to be committed and hearty. A bevy of running groups work together to keep each other motivated through the winter months, and the view around the Chain of Lakes in the spring makes it all worthwhile. Atlanta offers a variety of places to run but the most popular is by far the 17 miles of paved trails that take you on a tour through a Civil War battle site. Several popular races are organized every year by the Atlanta Track Club. There’s no denying that there are some fantastic parks in the U.S. parks system. No matter what sort of outdoor fun you’re into, you can probably find a U.S. park that can accommodate you. Love to run? Many parks feature great trails for running, and without the visual boredom of running circles around a track. Hard-core runners are always looking for places that put their endurance to the test. Arizona’s Lake Mead offers multiple trails that will test endurance and stamina while leading you into amazing canyons. If you are really looking to test yourself, remember that the temperatures in the Mojave Desert can reach 120ºF in the summer. And that’s in the shade. For the more casual runner, there are less dramatic running trails to occupy your time. If you’re looking for fantastic views to go along with your rigorous trail run, the Grand Canyon has the terrain you may be looking for. The running trails here are clearly marked, to prevent wandering into unsafe territory, and give you spectacular views at either sunrise or sunset. If you’re yearning for an extreme challenge, try the 21 miles of the rim-to-rim (R2R) run. If you’re serious and want to push your limits, go for the rim-to-rim-to-rim (R2R2R) run. That one will take you over approximately 40 rigorous miles. This park never seems to run out of hills and climbing trails, and the elevation never dips below 3,500 feet. The pride-and-joy of the park is the grueling 2.5-mile run ascending to Angels Landing. The reward at the end is the most spectacular view in the entire park. There are easier trails for those not up to the challenge of Angels Landing. For those looking for long distance, the Zion Traverse is a run from one edge of the park to the other; a total of 48 miles. Four islands make up this national park and each one proudly promotes its trails for hiking and running. To run these paths, you need to be surefooted and well-balanced, and you need to know the art of pacing yourself. There are various trails of differing levels, with most of the seriously challenging trails cutting a path into the mountainous interiors of the island, leaving the coastal trails for the casual runner. Length of the trails range from a short 2 miles to a strenuous 20 miles. The islands are only accessible by boat or plane, with the trip taking one to three hours. Whether you’re looking for the challenge of a lifetime or just a nice place to take a leisurely jog, don’t overlook the trails available at our U.S. National Parks. Some of the best scenery is to be found in these parks, so enjoy it as a bonus while you’re running. Some people find documentaries boring and will not even consider them as a great way to be entertained. If you are one who finds documentaries amazing, get ready for a great year. In 2015, many don’t miss movies have been released and these are the ones you will definitely not want to miss. Scientology has been widely disputed for years. In this dramatic documentary, the religion is laid wide open by archive footage, testimonials from former believers and people who were ranked high in the church. Many famous people, including Kirstie Alley, Tom Cruise, Nicole Kidman and John Travolta, share their thoughts about the good and bad sides of Scientology. You will be amazed at what you will learn about this often-scorned religion. In one of the few authorized documentaries about him, Kurt Cobain’s life is dramatically shared from his young days in Washington to the huge success he found with the band Nirvana. The movie also shares his downfall with the band and the sad end to his amazing life. Even someone who is not interested in boxing will enjoy this amazing documentary about three boxing greats. The movie covers the lives of Mike Tyson, Bernard Hopkins and Evander Holyfield. Their lives in the ring are shared, but it also takes a more personal look at the private life of each amazing man. Christian music is becoming more popular each week and the story of Hillsong United proves it. The Australian-based band has become so widely-known that it is estimated that 50 million people hear their songs each week. This documentary follows their amazing climb to become one of the most popular Christian bands in the world. Included in this amazing look at Kobe Bryant’s life are archive footage of some of basketball’s most awesome players, including Kareem Abdul-Jabbar, Larry Bird, Michael Jordan and Magic Johnson. Mr. Bryant shares what inspires him and also what he considers to be his biggest challenges. This is a definite must-see movie for any sports lover or anyone who just enjoys an inspiring story. Every person needs to see this inspiring movie that chronicles President Abraham Lincoln’s life from a small boy to his days as one of America’s greatest leaders. In a short 272 words, he details why the Civil War must continue, the evil of slavery and his vision of a perfect country where everyone is equal and free. This movie separates widely-accepted fiction from hard facts and shares the historical and cultural significances of the moving speech. It also shows how the speech is still affecting our country today. This is an examination of six ancient relics that are believed to have some connection to Jesus of Nazareth. Scientists, scholars and historians share their thoughts about whether these items are truly what Christians believe them to be. The documentaries being released this year have subjects that are so widely-varied that you are sure to find something that interests you. From religion to music to sports, the best of the year showcase inspiring people and bring history to life. People who do not run think that to start, all they need is a pair of tennis shoes and maybe a pair of shorts. As seasoned runners know, you do not need much equipment, but there are several items that are very important for the comfort and safety of anyone who runs. If you are just starting, do not worry about purchasing everything at once, but hard-core runners think the following items are ones you will want to consider as you progress with your hobby. Technology has more than found its way into the running scene. People who run for training purposes love to see how their stride compares at different times in their run and many gadgets will do much more than that. These gadgets will analyze your form as you run and will measure other things such as how often and long your feet touch the ground, your heart rate and the cadence of your run. For smartphone users, many of these new items will even sync to an app on their phone for more scrutiny. While the name may make you giggle, these are cool little rubber pieces that are used instead of shoelaces in your shoes. Each individual Hickie fits into the holes of your shoes and you can custom fit the way your shoes fit. Since you can move them around, you can loosen or tighten the places on your shoes that will offer you the most comfort as you run. Yes, even chewing gum has gotten into the running scene. RunGum was designed by an Olympic runner and launches this year. Each piece of gum gives you a kick of caffeine, taurine and B vitamins. It is designed as a pick me up that will work better than energy drinks or coffee that could cause upset stomachs if they are consumed right before a run. While many runners will hit the road regardless of the weather, there are days that running could be dangerous, such as snow, ice or storms. For those inclement days, every runner needs an amazing treadmill so they can still have their run each day. Many treadmills offer more than a basic run and you can choose what features you might need, such as incline runs. For cool mornings or cold winter days, clothes that pull moisture away from your body are even more important. Moisture in your clothes makes it hard for your body to stay at an even temperature and may cause a chill. If you become too cold, your body will not work at peak performance and you could even get hurt. Do not forget to purchase gloves and socks when you buy your shorts, pants and shirts. Running gear comes in many wild colors now so you are sure to find something funky, if that is your style. This is a funny name for small LED lights that you can easily clip onto your clothes. These lights make it easier for drivers to see you on dark nights or even during dreary day runs. Lights like these are so important to help keep you safe while you are enjoying your run. This list may seem overwhelming if you are just beginning to run, but do not feel as if you need to get everything. You will know as you get into running more which gear is right for you and what you truly need to be safe and comfortable as you run. On May 6, 1954, Roger Bannister ran a one-mile race in three minutes, 59.4 seconds. This established a new world record for the distance and shattered a number of widely held beliefs about the abilities of the human body and the risks involved in this degree of speed. Bannister’s feat served to set a new standard for long-distance speed and shattered the misconceptions held by numerous respected authorities in the scientific and medical fields. Bannister himself has pointed out that the fear of failure was a significant motivating force in his achievement. Many other runners came remarkably close to managing the four-minute mile prior to 1954; none, however, had broken that barrier prior to Bannister’s run at the Iffley Road track at the University of Oxford. Far from being an obstacle for him, however, the risk of failing to achieve his goal drove him to train harder and to push himself to faster speeds and better performance. Although Bannister and other long-distance runners were not deterred by the opinions voiced by some in the medical community regarding the serious risks of running so quickly, these fears were widely echoed among members of the public. Some suggested that bones could snap or muscles could tear due to the extreme stresses present at this high rate of speed. While injuries can occur during long-distance races, the risks of these accidents happening to properly trained and experienced runners are significantly reduced. The dire consequences predicted by certain elements within the medical profession never came to pass. Along with the predicted health risks, many authorities believed that a four-minute mile was impossible. They argued that the human body was simply not capable of reaching that level of speed and pointed to the top limits often demonstrated in the animal kingdom. A factor not often considered in these calculations, however, was the force of will and determination exhibited by runners striving toward this goal. The human drive to achieve and to succeed likely played a major role in allowing Bannister and other runners to break this barrier. Bannister’s achievement effectively silenced the naysayers and established a new paradigm in the sport of running. By facing the risks and persisting in his efforts, he was able to reach his goal and to demonstrate the amazing capabilities of the human body in this highly competitive arena. His persistence and sheer grit allowed Bannister to reach the pinnacle of his sport and to earn his place as a legendary distance runner. Today, top athletes in track and field routinely achieve four-minute and under times for the mile distance. Their accomplishments are worthy of praise and acclaim. These runners have been inspired by the courage and determination of Roger Bannister and his contemporaries in the sport. One of the most inspirational stories in the sport of running is that of Glenn Cunningham. Glenn was born in Kansas in 1909 and grew up in the small community of Elkhart. When he was just seven years old, a schoolhouse fire claimed the life of his 13-year-old brother Floyd and caused serious burns to Glenn’s legs. Amputation was recommended by the doctors in attendance. Glenn persuaded his parents against the procedure, however, and began a course of therapy and treatment to restore function to his badly damaged legs. Both Glenn’s legs were seriously burned in the fire. The toes on his left foot had been seared away along with most of the muscle of the transverse arch. His right leg fared little better; much of the flesh and muscle that made up its length was gone, leaving it about two inches shorter than previously. Without the skin grafts and transplant procedures used today to help burn victims recover more quickly, Glenn and his parents were forced to use more primitive therapies that included massage and stretching of his largely useless lower limbs. These treatments were painful in the extreme. Glenn and his parents persisted nonetheless in the hope that he might one day regain the use of his legs. Although Glenn was confined to a wheelchair for several years during his childhood, he often escaped it to crawl to the nearby fence and use it to support himself as he put weight on his legs. This persistence and determination resulted in some feeling returning to Glenn’s legs and his eventual ability to walk once more. The scar tissue left from his accident, however, made walking painful and difficult. As Glenn persisted in his efforts, he made a surprising discovery: Running was much less painful than walking. Glenn’s journey to the top of the distance running sport had begun. Glenn was soon competing in the one-mile races at Elkhart High School. During his senior year at the school, he broke the U.S. record with a one-mile time of four minutes, 24.7 seconds. This marked the first time that Glenn Cunningham had gained national attention for his athletic abilities. It would not be the last. During his tenure at the University of Kansas, Glenn trained under highly esteemed coach Brutus Hamilton and continued his winning ways in intercollegiate competition, repeatedly breaking records in both the half-mile and mile races. Glenn competed for the U.S. in the 1932 and 1936 Summer Olympics. While he did not win during either competition, he continued to set world records for speed in the mile, 800-meter and the indoor mile. Today, Glenn’s story serves as a beacon of hope not only for long-distance runners but also for those facing difficult roads to recovery. By remembering Glenn Cunningham and his remarkable journey back from tragedy, athletes can motivate their own rise to the top of their chosen sports.